As cosmic-ray particles are accelerated by a black hole in this artist's interpretation, they stream toward Earth as very-high-energy gamma-rays. Upon hitting the atmosphere, they produce a shower of particles that rain down on Earth. Most of these particles run out of energy before they hit sea level. A new observatory high in the mountains of Mexico is combining high altitudes and tanks of extra-pure water to attempt to solve one of the greatest unanswered questions in all of physics. The observatory, dubbed the High Altitude Water Cherenkov (HAWC), has started to study the highest-energy photons ever discovered. The origin of these powerful particles — called teraelectronvolt (TeV) gamma-rays — remains a mystery, but scientists working with the HAWC hope to solve that puzzle. To accomplish that, the HAWC telescope relies on enormous tanks of extra-pure water to capture its data. Mapping the sky with only one-third of its detectors, HAWC has already captured three regions of excessive energy, shown in red. Protons, electrons, neutrinos and gamma-rays all make up a class of particles known as cosmic rays, which constantly bombard the Earth's atmosphere. Of these, only neutrinos and gamma-rays travel in straight lines, allowing scientists to more easily determine the sources of these particles. The most energetic among these — TeV gamma-rays — have energies roughly equivalent to the energy of a tennis ball in full flight. Such energies are about 20 times higher than those of the highest-energy particles produced on Earth by CERN (the European Organization for Nuclear Research) in the Large Hadron Collider, making cosmic rays a unique phenomenon that has not been reproduced by machines on Earth. To reach their high energies, TeV gamma-rays must be accelerated to extreme speeds. Scientists anticipate that black holes and intense gravitational and electromagnetic fields raise the cosmic rays to their rapid velocities, but they have yet to confirm this. In 2002, the question of how cosmic rays are accelerated was identified by the National Research Council's Committee on Physics of the Universe as one of the "11 Greatest Unanswered Questions of Physics." 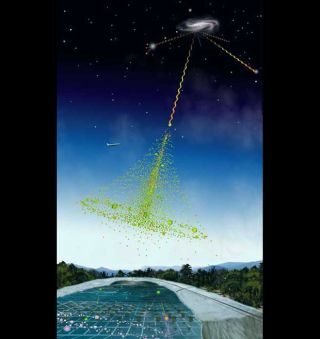 When very-high-energy gamma-rays hit Earth's atmosphere, they produce a shower of millions of particles that fall to Earth until they run out of energy or hit the ground. Only the highest-energy particles reach sea level, making them a challenge to study at low elevations. Built at 13,500 feet (4,100 meters) above sea level, HAWC seeks to eliminate one difficulty by studying the particles high in the atmosphere. When totally completed, the observatory will consist of 300 tanks of extra-pure water known as Cherenkov detectors. At 16 feet (5 m) high and 24 feet (7 m) in diameter, each enormous tank contains four highly sensitive light sensors fixed to the bottom. As the particles rain down from the atmosphere, scientists can reconstruct the direction and energy of the original gamma-rays that hit the detector, to solve the mystery of their acceleration. The HAWC array, viewed from the summit of Sierra Negra. One of HAWC's advantages is its ability to study incoming gamma-rays at almost any direction. Its wide field of view means it can watch large swaths of the Northern Hemisphere sky at once, and it is not limited by the weather or the time of day. Cosmic rays continue to bombard the atmosphere day and night, rain or shine, and the observatory monitors these interactions without being impeded. HAWC also works well with space-based telescopes like the Fermi Gamma-ray Space Telescope, which studies gamma-ray sources from space. "HAWC will have comparable sensitivity to Fermi for hard spectrum galactic sources, but at 100 to 1,000 times the energy," Goodman told Space.com via email. "If Fermi sees a flaring object, HAWC can follow up at higher energies." Enormous tanks of extra-pure water 16 feet (4.9 meters) high and 24 feet (7.3 m) in diameter collect information about the high-energy gamma-rays that collide with them. The full array of detectors is expected to go online by the end of the year. However, with only one-third of its detectors operational for three months, the observatory has already made intriguing observations. The final instrument will be between 10 and 15 times more sensitive than existing high-energy gamma-ray detectors, Goodman said. "We have already seen some sources that have not been seen before," Huentemeyer said. In HAWC's view of the sky at high energy levels, the galactic plane dominates as the brightest feature. In its first few months, HAWC spotted three regions of excessive energy whose source remains a mystery. One possible interpretation of the high-energydata is that they are caused by regions where dark-matter particles collide with and annihilate one another, producing energetic gamma-rays in the process. Other possible causes include turbulence in the galactic magnetic field or the decay of exotic particles. As more detectors come online, not only will more events become detectable, but information about individual events will improve. "We will be able to better reconstruct the energy spectrum of the emission, and say with more certainty what the nature of these cosmic rays is," Huentemeyer told Space.com by email. "It will be exciting to see if additional regions of excess and more structure may be revealed with more data from the complete detector."